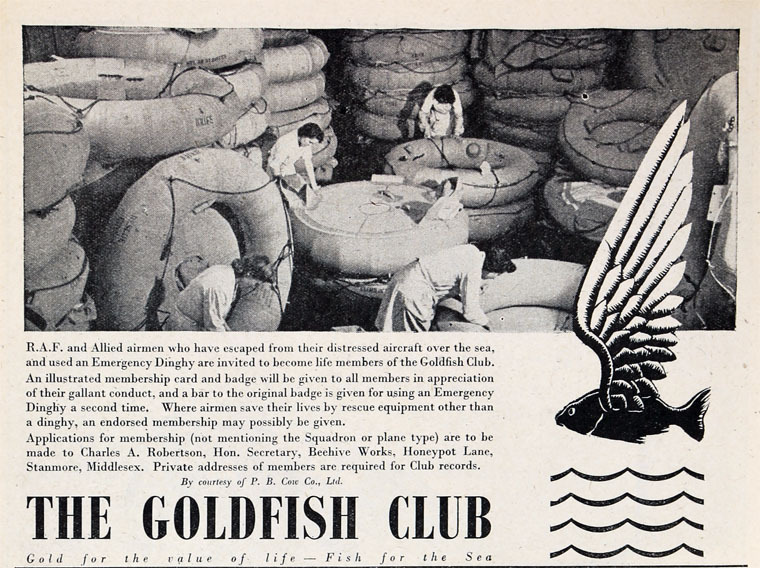 The Goldfish Club is a worldwide association of people who have escaped an aircraft by parachuting into the water, or whose aircraft crashed in the water, and whose lives were saved by a life jacket, inflatable dinghy, or similar device. 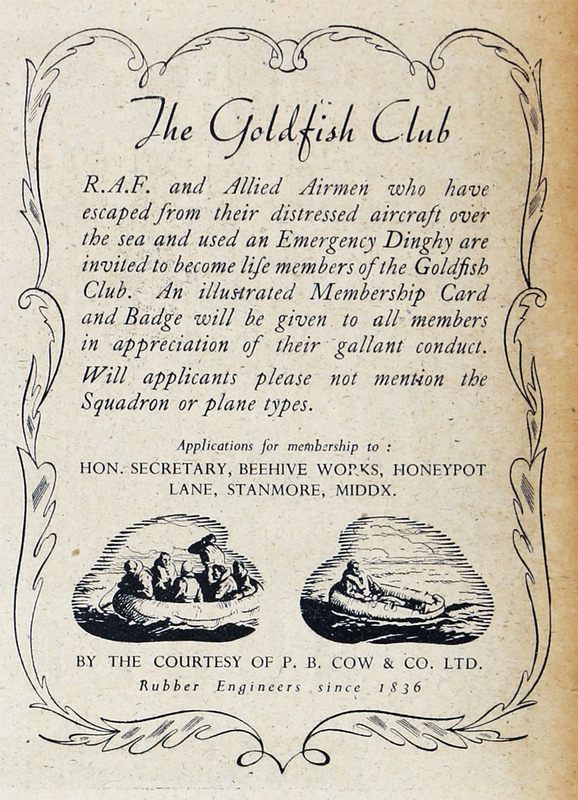 The Goldfish Club badge shows a white-winged goldfish flying over two symbolic blue waves. The main aim of the club is 'to keep alive the spirit of comradeship arising from the mutual experience of members surviving, "coming down in the drink". 1942 Formed by C. A. Robertson chief draftsman at P. B. Cow and Co, a world leader in air-sea rescue equipment. After hearing of the experiences of airmen who had survived a ditching at sea, Robertson decided to form an exclusive club for airmen who owed their lives to their life jacket, dinghy, etc., enabling members to meet and exchange experiences. 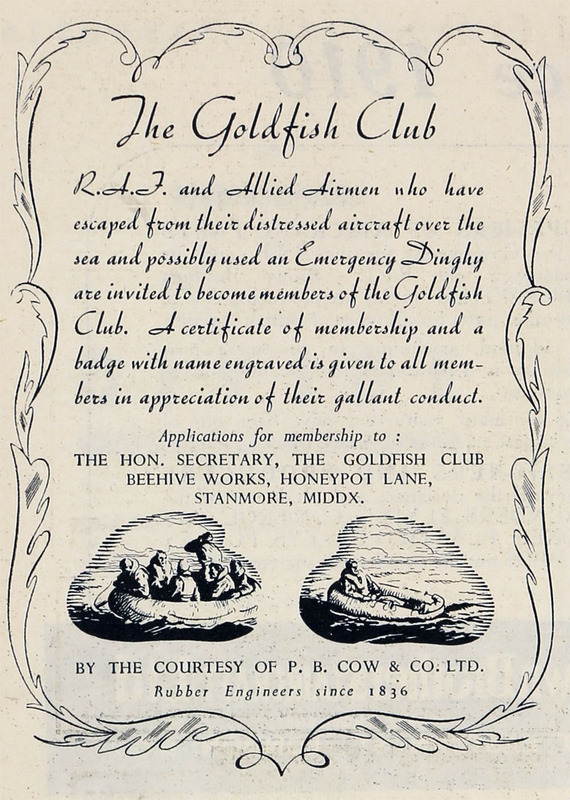 With the company’s backing, the club was named The Goldfish Club: gold for the value of life, and fish for the water. Each member was presented with a heat-sealed waterproof membership card and an embroidered badge. By the end of World War II, the club had 9,000 members from all branches of the Allied forces. The club attempted to end the granting of memberships, but applications continued to arrive. When Robertson left PB Cow in 1947, he retained the club records and continued operating it at his own expense. An article in the RAFA journal Airmail in January, 1951, renewed interest in the club, and a reunion dinner was held. It was a great success, and the club was reorganized on a formal basis in March, 1953. Reunions have been held annually ever since at various venues with many distinguished guests. In response to a message of greetings sent to her, Mae West made it clear that she took great pride in the fact that members of the RAF had adopted her name for their life-jackets. Today, with over five hundred members around the world, the annual subscription is £5 and they keep in touch with a regular newsletter and annual get togethers. This page was last edited on 17 March 2016, at 16:03.